Servicing Kent, Washington, Newport County. 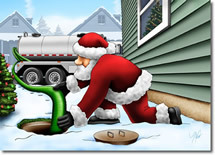 Tis the season for visiting….for eating….for gathering…and for septic system issues. Family gatherings during the holidays are what it’s all about. Unfortunately they also put extra strain on your septic system. So how do these issues start? More time in the kitchen making scrumptious treats and holiday dinners will surely increase the amount of water being used. Be extra conservative with water usage when rinsing items or in running the dishwasher. Only run it when it is full. And remember: never dump food waste or oils down the drain. We know that morning is the prime time for people to shower and bathe, but consider staggering the times that people take their showers. This will help to reduce the amount of water entering your septic system. If guests are not flexible in their scheduling, request that your guests take shorter showers. While we are on the subject of reducing water from washing: try not to run consecutive loads of laundry. Also, just like with the dishwasher, only run full loads and plan to do your loads over a period of several days. It goes without saying that feminine hygiene products should never be flushed (at any time of year!) In the nicest way possible, request that your guests remember not to flush these items and that excessive toilet paper usage is also to be avoided. Taking the time to let your guests know your wishes can help to avoid potential blockages. Pumping your system if it has had issues in the past is a wise choice. Try to schedule it close to your gathering. This will give your system a buffer as no doubt, there will be guests who will need to use the bathrooms. We hope this helps get you prepared for your holiday, because, seriously….no one wants a system backup to ruin their Holiday fun. Think it is time to replace your system after the holidays? Give Grenco a call and let’s plan to start 2018 right! PreviousIs Your Septic System Ready For Winter? NextSeptic System Additives: Do They Really Work? © Copyright 2017 Grenco, Inc. All rights reserved.